We have to rely on recorded music to re-live those heady days of fifty years ago. The British version of the music never appealed to the major recording companies and it was left to smaller independent companies, who tended to have problems with distribution and availability, to preserve it for posterity... The first of these was Esquire founded and run by Carlo Krahmer. They recorded Ronnie Scott and the Club Eleven musicians from the start of British Modern Jazz in 1948 including many titles by the Johnny Dankworth Seven in the early 1950s. 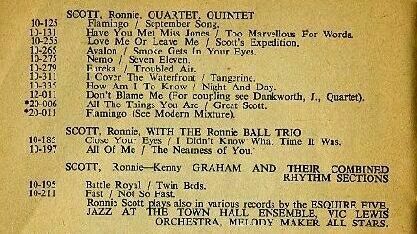 Ronnie Scott recorded for Esquire through the mid 1950s in a number of quartets or quintets led by himself. They recorded his legendary Orchestra as well as a number of BBC World Services live broadcasts. Another independent company Melodisc was formed in the late 1940s by Emil Shalitt, a businessman of Serbo-croation origin. He was not that interested in the music, being a businessman he was interested in profit and recorded British modern jazz for a few years in the early 1950s. He was assisted by Siggy Jackson and the label went on to record Jamaican music for many years including reggae which presumably was more profitable than the British jazz. During the mid to late 1950s Tempo Records, another small independent, founded by Colin Pomroy and George Davies in 1946, issued a series of LP's that captured the major performers of the time. Tempo went out of business in the early 1960's and the recordings had been unavailable, except through the second hand vinyl market, for nearly 40 years until Jasmine Records began to re-issue the modern jazz sessions in CD form from 2001. Many of these now classic British modern jazz records were produced by Tony Hall who, working on a shoe string, captured all the major modern jazz stars of the 1950s. Jasmine have now re-issued virtually all the old Tempo modern jazz records as well as early tracks from companies such as Vogue, Melodisc, Decca, Paxton and others. In the late 1940s and early 1950s most of the major record companies produced comprehensive catalogues of their records often including band personnels. These catalogues often ran to 50 or 60 pages, sometimes more. The Esquire catalogue, (cover picture on left), dated December 1953 and priced at one shilling ran to 40+ pages of jazz records. 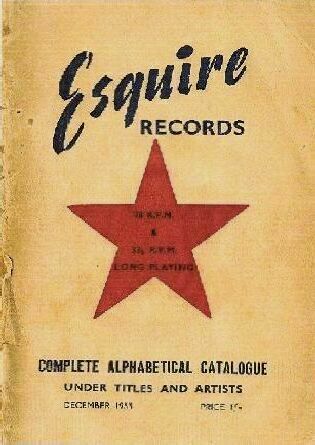 Although Esquire recorded British modern jazz at this time the vast majority of the records in the catalogue were of American jazz which Esquire issued on their own label under licence.